The Border and Transportation Security Data, Sensor, and Alert–Fusion Center (BTSDSA-FC) is a DOHS pilot program and developmental test platform to demonstrate new technologies applicable to the security of our nation’s borders. The increasingly complex environment of the U.S. borders drives the requirement for the presentation and interactive control of the stream of information arriving from the various data sources and sensors. The Situation Awareness picture becomes fragmented without the benefit of data fusion and correlation to present a true picture from all information sources. The DSA-FC system, currently being deployed along the Arizona border, enables automated capabilities previously not available, supporting a new Concept of Operations for automated border security. The BTSDSA-FC provides an adaptable Common Operating Picture (COP) framework for sensor fusion and Geographic Information System (GIS) integration that directly addresses system characteristics for collaborative sensor fusion. The objective is a framework based on common components that can be tailored to meet unique automated border security requirements. Fusion combines data from a wide array of sensors into a single, unambiguous data set to produce information of value to the user, deal with conflicting data, and produce interim results that can be revised as more data becomes available. Sources may include, but are not limited to, video, radar, and Unattended Ground Sensors (UGS) such as seismic, magnetic, and passive infrared. Since no single sensor provides the capability to find, fix, track, target, engage, and assess in all weather conditions, the ability to fuse information from various sensors enables multiple looks at each target and takes advantage of the strengths of each sensor type to increase target identification and location accuracy. The BTSDSA-FC also provides field agents direct wireless access to sensor alerts, location, and relevant data to provide actionable intelligence in the form of indications, warnings, incident responses, and situation maps. 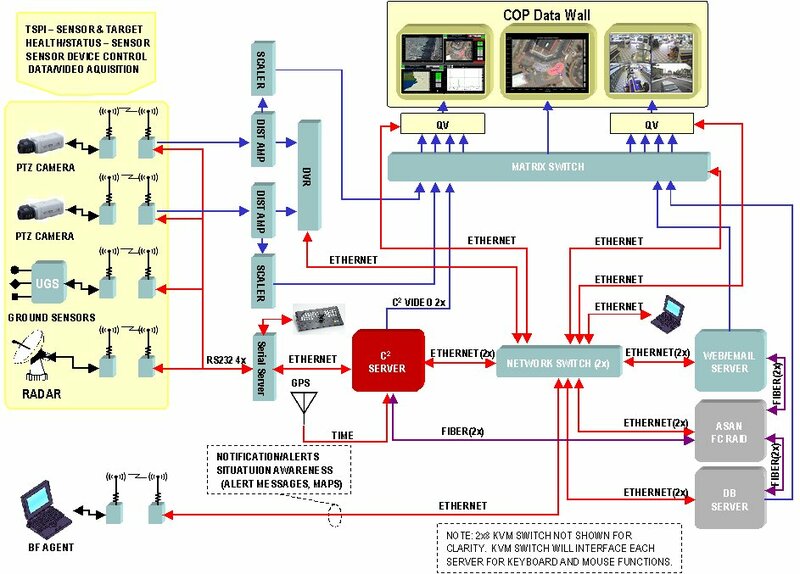 The BTSDSA-FC architecture is based on COTS C3I middleware that integrates sensors, data fusion algorithms, and command and control components for real-time situation awareness and operations automation. Open and reusable services support interoperation and architecture extension for evolving border patrol requirements with the Security and Surveillance Toolkit. Core services provide most BTSDSA-FC software functions out-of-the-box (data acquisition, processing, recording, and reduction, simulation, configuration management, map visualization, track geo-referencing, etc.). Border Patrol adaptations consist of extending existing software pattern and templates for creation of specific sensor plug-ins, integration of fusion engine and sensor controls, and configuration of the HMI for the border patrol ConOps. While the C3I middleware is proprietary, it is also open and has significantly accelerated BTSDSA-FC implementation, which was critical to meeting project objectives. The BTSDSA-FC is being integrated and fielded by Global Technical Systems, Inc. (GTS) under contract to DHS – Science and Technology Border and Transportation Security. GTS is supported by Command and Control Technologies Corp. and Daniel H. Wagner Associates, Inc. providing key C2and fusion components and technical support. The initial pathfinder configuration is deployed in Southern Arizona, with another version deployed on Lake Erie. Both systems integrate threat, blue-force and multi-sensor fusion to create a common operating picture and provide automated tracking and interdiction. Perhaps the most important result of the pathfinder to date is the demonstration of the overall system framework of loosely coupled common assets that provide real-time intelligence and priority based targeting that can evolve with the expanding border patrol needs for increased situation awareness and operations automation. Doing so at a fraction of the cost of traditional custom systems. Contact us at info@cctcorp.com if you would like more information on the DSA-FC project or wish to talk with a technical representative concerning applying CCT’s command and control product line to your automated surveillance application.